Historicist: Mismatch of the Century or a Football Game? Sports page from the Toronto Star on August 6, 1959. Anticipating the arrival of the NFL’s Chicago Cardinals for a pre-season exhibition game against the CFL’s Toronto Argonauts on August 5, 1959, The Star‘s Jim Hunt asked the obvious question: “Argos against the Chicago Cardinals—the mismatch of the century or a football game?” The Argos, who’d dominated the CFL for most of the early twentieth century, were now in the early years of what became known as The Dark Ages. The league’s perennial bottom-feeders between 1953 and 1983, the Argos went nineteen years between Grey Cup appearances and thirty-one years between Grey Cup victories. As if to make up for their on-field futility, according to Jay Teitel’s The Argo Bounce (T.H. Best Printing Co. Ltd., 1982), the franchise simply tried to play with big league style by signing one big-money player after another. In this, the team seemed to reflect Toronto’s post-war insecurity and its ambition to prove itself a world class city. With the huge success of the 1959 exhibition game—with 27,770 fans in attendance, it was the largest crowd to watch football in Canada at that time—the Argos hosted similar exhibition games in 1960 and 1961. Leading up to the 1959 game, Toronto’s bars and coffee houses were abuzz with debate over the merits of each league. Few gave the Argos much chance of beating the Cardinals. There was already a growing sentiment, as Ron Thomas made clear in The Star, that “Canadian football teams are inferior to those from below the border.” Despite the fact that the free flow of players between the two leagues showed that individuals could certainly succeed in either one, the handicaps suffered by CFL teams were too significant. Most notably, CFL players were smaller and usually played on both offense and defense, while NFL teams had the depth to field a roster with specialists at each position. Some thought the hybrid rules being used in the exhibition game might minimize these advantages. Canadian restrictions on downfield blocking were eliminated in favour of American-style play. But Canadian kicking and returning rules would apply, thus eliminating the NFL’s fair catch rule. Playing on the larger Canadian field with only eleven players, instead of the CFL’s twelve, ensured the game would be a high-scoring shoot-out. The game was a flashy opener for the brand new home of the Argos, CNE Stadium, which with little protection from the lake’s fierce wind, couldn’t have been more different than the cozy bowl at Varsity Stadium. Yet before it acquired the “Mistake by the Lake” moniker, CNE Stadium was celebrated as a symbol of Toronto’s progress equal to the opening of the Yonge Street subway. Naturally, the game was front page news—but not for on-field action. Instead it was the massive traffic problems that drew the biggest headlines. Police called it the “worst traffic jam in the city’s history” as twelve thousand vehicles vied for the seven thousand parking spots on the Exhibition grounds. Drivers resorted to parking on a section of the still-incomplete Gardiner Expressway and on front lawns in Parkdale. On the field, the Argonauts surprised everyone by roaring out to a 13-1 lead. By racing to the line of scrimmage to quick-snap the ball on every down, the Argos caught the Cardinal defenders off guard. Quarterback Ronnie Knox thrived in the pass oriented “Argo Shift,” a formation designed to get five receivers downfield quickly instead of four. Knox marched the Argos fifty yards down the field in four plays to connect with Dave Mann, a versatile former Cardinal receiver who also acted as the Argos punter, for a touchdown. Shortly afterwards, defensive star Bob Dehlinger intercepted a Cardinals pass and ran seventy yards down the field for another score. 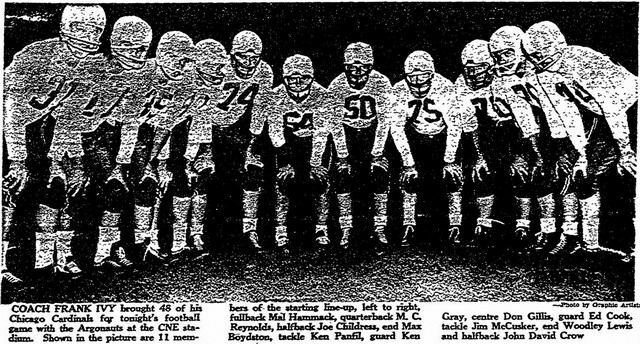 Image of the Chicago Cardinals from the Toronto Star on August 5, 1959. Toronto assistant coach Steve Owen—who would be enshrined in the hall of fame for his long tenure as head coach of the New York Giants between 1930 and 1953—knew that the biggest obstacle for the Argonauts would be Chicago’s massive defensive line. At an average of 255 pounds, the Cardinal linemen outweighed their Argo counterparts by about twenty pounds. It was only a matter of time before this decisive size advantage wore down the Argos and turned the tide of the game. The Argonauts held the lead well into the second quarter when disaster struck. The heart of the Argos defense, Don Caraway, broke his foot in a tackle. Without their leader, the Argos defense collapsed. The Cardinals won the game 55-26—one of the few bright spots in an otherwise abysmal season that saw them finish last in their NFL division. Three more first-string Argonauts were injured on the day, including the best centre in the Canadian league, Norm Stoneburgh. 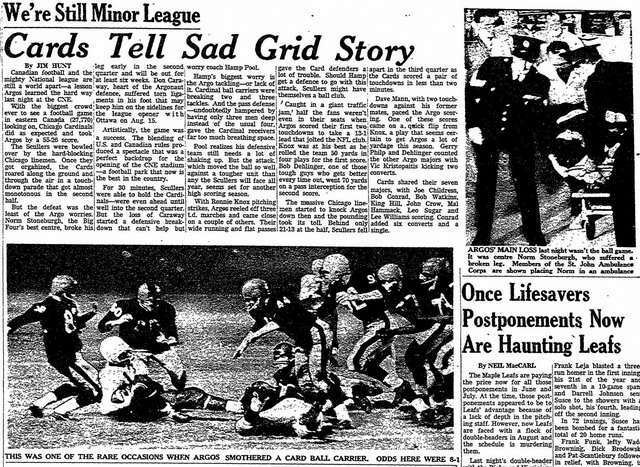 After the game, these injuries, which ensured the team finished in fourth place in their division and out of the playoffs, led sportswriters and fans to question the wisdom of playing exhibitions against NFL teams. 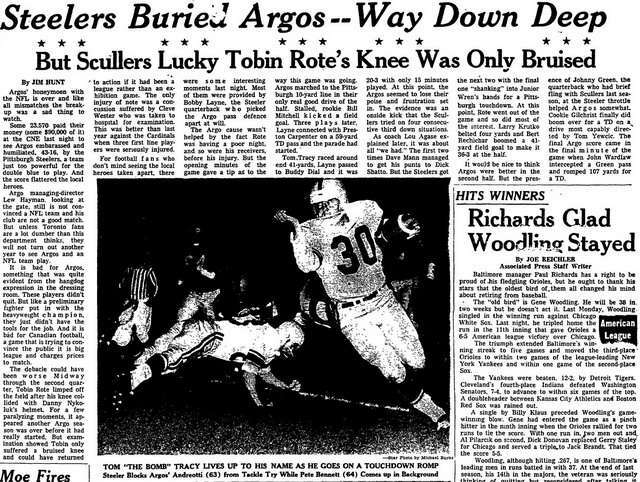 Sports page from the Toronto Star on August 4, 1960. Nevertheless, team president Lew Hayman—once a coach of unparalleled success, now an unmitigated disaster in upper management—claimed that because of demand from fans there’d be more NFL exhibitions games. Globe and Mail columnist Milt Dunnell, however, felt the interest in the NFL was inflated because, much to the chagrin of season ticket holders, the Argos had included it as a mandatory addition to the season ticket package. For the most part, the press saw the Argos-NFL exhibition games as mere cash-grabs for a team willing to sacrifice a season’s fortunes for the sake of a big day at the box office. By this time, other CFL teams were cashing in on the novelty of playing American teams. The Montreal Alouettes lost to the Chicago Bears, while the Hamilton Tiger-Cats succeeded in beating the laughing stock of the AFL, the Buffalo Bills. The press, however, remained highly critical, arguing that staging exhibitions against the bigger NFL teams did a disservice to, even cheapened, the Canadian game. Jim Hunt compared the Argos to “a preliminary fighter put in with the heavyweight champion”; “they just didn’t have the tools for the job.” For much of The Dark Ages, the Argos weren’t willing to embrace that the far-reaching yet subtle rule differences in the Canadian game not only created a different style of play from that south of the border, but created a completely different sport. Instead, the team too frequently tried to contort the Canadian game into something it wasn’t and in their strident efforts to appear “big league”—perfectly exemplified in the exhibitions against NFL teams—made themselves appear anything but. 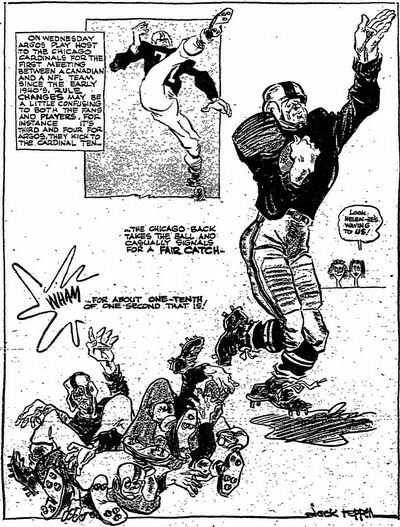 Cartoon of the hybrid rules from The Star on August 1, 1959. 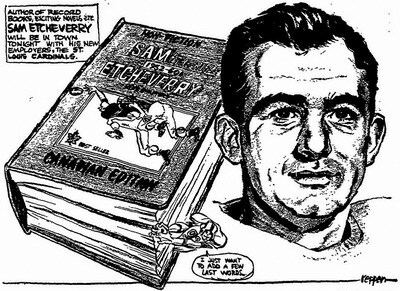 Cartoon of Sam Etcheverry from The Star on August 2, 1961.